Dimitrios Galanis studied at the Athens School of Fine Arts (1897-1899) and attended drawing classes given by Nikephoros Lytras. He settled in Paris, where he studied at the École des Beaux-Arts. His caricatures were published in French humour magazines (1901-1912); he also contributed to German magazines, as he lived in Germany from 1907 to 1909, specialising in printmaking. 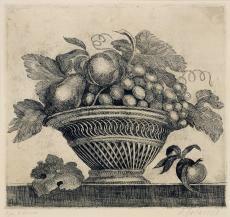 From 1918, he began to illustrate books; and his first solo exhibition was held in Paris in 1922. From 1930, he applied himself exclusively to printmaking, to which he introduced many Greek artists, in his studio in Paris (1930-1937). In 1945 he was appointed professor at the École des Beaux-Arts in Paris. He was a member of the French Academy and the Academy of Athens. 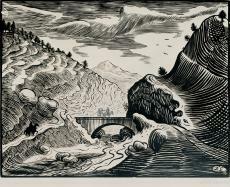 A printmaker and a painter, Galanis, with his extensive, high-quality oeuvre, is regarded as the great master and innovator in Greek printmaking and he inspired younger generations of printmakers. His style was shaped in 20th-century Paris, where he became associated with great figures of the art world. He was inspired by such movements as Cubism and Fauvism; André Derain’s ‘classicist’ phase between World Wars I and II especially influenced his painting. 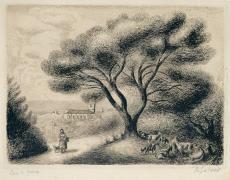 Prints of various techniques – aquatints, wood engravings and an etching – are on display in the A. G. Leventis Gallery. 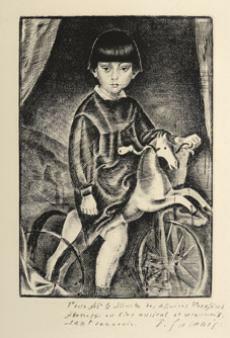 Child on Mechanical Horse is one of Galanis’ most popular prints. It is a portrait of his son as a child, based on the painting of the same name of 1914, which is known only from published reproductions. Although the original composition remains essentially unaltered, the medium of etching enabled the artist to treat individual elements in a different way, such as the rendering of the boy’s facial and physical features, or the volumes of the complementary elements in the image. Moreover, he used variety and gradation in his etched lines to achieve an effect of a multilayered space that forms a composition with inner unity. 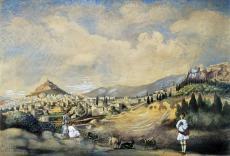 Two watercolours, 40 years apart, illustrate Galanis’ approach to landscape: influences from the style and approach of Far Eastern art are evident in the sparse and distinctively composed Japanese Landscape, of 1899; while View of Athens, dating from 1939, is a naturalistic evocation of the pre-war landscape of the Greek capital.